Kuala Lumpur, 19 October 2017 – EzCab recently launched its latest service, EzCab (6-seater). This newest inclusion introduced Toyota Alphards and Toyota Vellfires to its fleet, will add a touch of class to its service while providing its users with a luxurious option to travel. 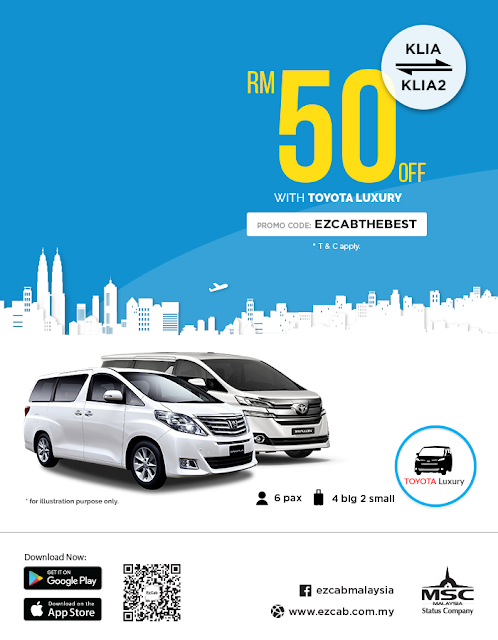 “We have had several enquiries especially from travellers for a larger car, and to cater to their convenience and travelling needs, we are excited to launch EzCab (6-seater),” said Nor Aleeshah binti Abdullah, Executive Director of EzCab Sdn Bhd. The new service will accord users with a VIP experience at a cost-effective price. EzCab’s 6-seater option is priced at a competitive rate, on-par with the market pricing of limousines in the country. To mark the launch of the service, EzCab will be offering a RM 50 discount on all rides within Klang Valley in its 6-seaters from 15th October 2017 onwards. The EzCab (6-seater) can be booked in advance (minimum 3-hours before pick-up time) for ease of mind. The fee charged is inclusive of toll charges and is available to travel nationwide. Never resting on its laurels, EzCab also announced the coming off its 8-seater fleet sometime in December 2017. This move is to cater to the KLIA/KLIA2 airport transfers, and nationwide travel for both leisure and business. The new service will come with ‘Fixed Fare Priority Booking’ which translates to less waiting time for users. EzCab’s 8-seater fleet will be manned by commercial licensed drivers, that provides commercial insurance coverage for both drivers and passengers. The launch of the 8-seater will be accompanied by corporate rates, void of surprises such as ‘Surge Pricing’. Aleeshah added, “EzCab is proud to have a diverse group of users, and we are always striving to cater to their varied needs. Travellers, and corporates will require a method of travel that is convenient, reliable, and safe. With the coming of the 8-seater, we will be able to meet all of their wants, ultimately resulting in their satisfaction. EzCab Sdn Bhd was recently awarded the MSC status from the Multimedia Development Corporation (MDEC), with the Malaysian born ride-hailing company saying that this marked the start of the company’s aggressive push to bridge the gap between the taxi industry and the digital economy. “This certification is a huge step forward for our company. Being among the few app-based companies in the country to receive this certification, places us ahead of the competition and showcases our commitment towards providing quality service to our users,” said Nor Aleeshah binti Abdullah, Executive Director of EzCab Sdn Bhd. EzCab was founded in 2013 with the sole purpose of making the taxi industry more competitive in the face of increasing popularity of other ride-hailing apps, and the growing disillusionment among users towards taxis. Since its inception, EzCab has grown its fleet to surpass the 3,000 mark, and is now present across the country in Penang, Perak, Klang Valley, Seremban, Melaka, Johor Bahru, and Sabah with further expansion planned in the near future. The Malaysian brand has spearheaded several key changes in the industry, among which, being the first e-ride hailing app in Malaysia to introduce the ‘SOS Button’ to its app, for the comfort, safety, and peace of mind of all taxi users in the country. The feature is backed up by a 24 hour a day, 7 days a week Customer Support Centre, which has led to EzCab developing a loyal following amongst users that demand reliability and security. EzCab app is available for download on both Google PlayStore and Apple App Store. Should you require information about this topic, please contact Nor Aleeshah binti Abdullah at +6012 2948 483 or email at nor.aleeshah@ezcab.com.my. Get to know what EzCab is up to by visiting their website at http://ezcab.com.my/ or official Facebook page at https://www.facebook.com/ezcabmalaysia.